A fire broke out in shed this afternoon destroying it and threatening the house in front. The shed behind a property in Clarkes Avenue was completely destroyed by the blaze which also set alight to nearby fence panels. 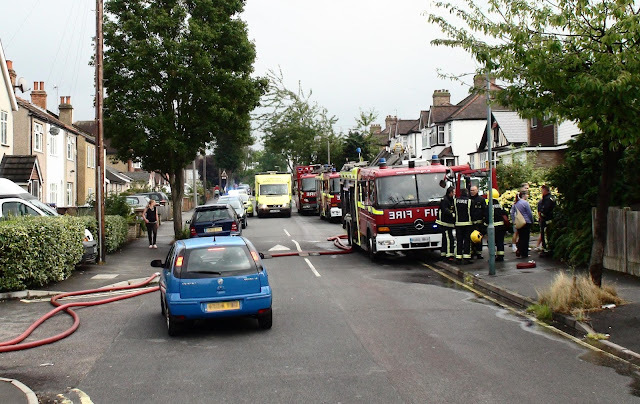 The fire brigade, who had been called by several people in the area had it under control quite quickly but not before the heat from the flames had started to blister the paint on the main house. Numerous fire fighters were on the scene with two fire engines coming from Sutton and a command unit coming all the way from Woodside near Ashburton (past Croydon). There were also Police and ambulances in attendance. One of the fire fighters told the blog that it was a very intense fire. They described it as “hot and scary”. The property owner is understood to be being treated for shock at a neighbour’s home. It is not yet known what caused the fire.